Currently, demand for paints and coatings with low-gloss matte finish is lesser than that for paints and coatings with glossy finish. End-users, especially in the consumer industry such as the automotive sector, prefer glossy finishes. Therefore, demand for paints and coatings with low-gloss matte finishes is rising at a moderate pace. Matting agents are extensively employed in architectural coatings due to the high preference for low-gloss finishes. Customer preference for low-sheen, low-gloss, and matte-finish products is rising due to the increase in awareness about the benefits of low-glare products. Low-gloss surfaces prove to be less disturbing visually, especially in larger spaces. Rise in demand for matte finishes and growth of end-user industries such as automotive and construction are anticipated to fuel the demand for matting agents in various coating formulations, especially wood and coil coating formulations, during the forecast period. Demand for UV-cured coatings has been increasing significantly in the last few years. Major factors influencing the choice of coatings for any application include cycle times, cost efficiency, and emission of volatile organic compounds (VOCs). Currently, the matting agents technology is not compatible with UV-cured coatings. Therefore, rise in preference for UV-cured coatings is anticipated to hamper the silica-based matting agents market in the next few years, unless an alternative matting technology, which is compatible with UV-cured coatings, is developed. Based on type, the global silica-based matting agents market has been segmented into precipitated silica, fumed silica, natural silica, silica gel, perlite, and flux-calcined diatomaceous earth. The precipitated silica segment is anticipated to dominate the silica-based matting agents market. Precipitated silica has a unique surface structure, favorable flowability, and high absorptivity. Its physical properties can be manipulated during its manufacturing to suit the requirements of the application. It is extensively employed as a matting agent in the paints & coatings industry. The segment is estimated to account for a dominant share of the market during the forecast period. The natural silica segment is estimated to expand at a rapid pace during the forecast period, as it is a natural product and its environment friendly. Demand for solvent-free coating technologies such as UV curing is rising. Silica-based matting agents are efficient and compatible with UV cure coatings. Therefore, the others segment is anticipated to expand at a substantial pace during the forecast period. In terms of technology, the global silica-based matting agents market has been segregated into solvent-based, water-based, and others. Water-based silica-based matting agents are eco-friendly and are utilized in paints & coatings applications. This type of silica-based matting agents generate negligible VOC emissions; therefore, they are referred to as eco-friendly. Additionally, they are compatible with water-based resins. Therefore, the segment is estimated to expand at a rapid pace during the forecast period. In terms of application, the global silica-based matting agents market can be divided into industrial coatings, wood coatings, architectural coatings, automotive coatings, and others. The industrial coatings segment can be further classified into metals, papers, plastics, printing inks, and others. The industrial coatings segment to expected to dominate the global silica-based matting agents market during the forecast period. Wood coatings and architectural coatings segments are projected to propel the silica-based matting agents market. Consumer demand for low gloss and matt finishes in these applications is rising. This, is in turn, is driving the requirement for matting agents. Based on region, the global silica-based matting agents market can be classified into North America, Europe, Asia Pacific, Middle East & Africa, and Latin America. Asia Pacific is a major consumer of matting agents, especially silica-based matting agents. High demand for silica-based matting agents is attributed to the huge paints and coatings industry in the region. Europe is a key consumer of silica-based matting agents in the world. Demand for silica-based matting agents is anticipated to rise at a sluggish pace in Europe during the forecast period. North America constitutes a significant share of the global silica-based matting agents demand. Demand these agents is anticipated to rise at a moderate pace between 2018 and 2026. 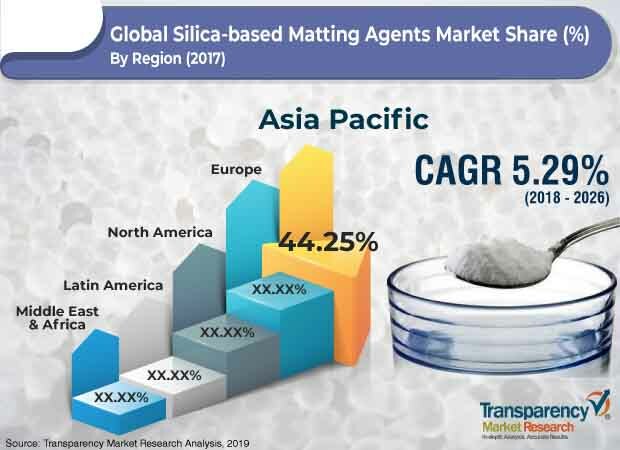 The market in Latin America and Middle East & Africa is anticipated to expand at a considerable pace and create lucrative opportunities in the silica-based matting agents market during the forecast period. The global market is dominated by large players. They account for dominant share of the silica-based matting agents market. The market is highly consolidated. Key players operating in the market include Evonik Industries AG, W.R. Grace & Co.-Conn, PPG Industries, Inc., PQ Corporation, The Lubrizol Corporation, Imerys, and Akzo Nobel N.V.